Earlier this year, the Government unveiled its plans for Island of Ingenuity (IOI), a Rs. 300 million investment in the ICT/BPM sector. By 2022, Sri Lanka’s IT/BPM sector is expected to reach $5 billion in revenue, create 200,000 direct jobs and encompass 1,000 start-ups. STAX’s report highlights that Jaffna is uniquely positioned to capitalise on the sector’s growing momentum, ultimately expanding its own contribution to the sector and the wider national economy. “Among the noteworthy attributes, we observe a positive and entrepreneurial attitude among the Jaffna communities, who also retain a strong connection to the Sri Lankan diaspora – which could lead to opportunities for investment and knowledge transfer. The region also maintains a high literacy rate while already possessing the necessary ICT infrastructure and a range of opportunities for IT education,” the report noted. 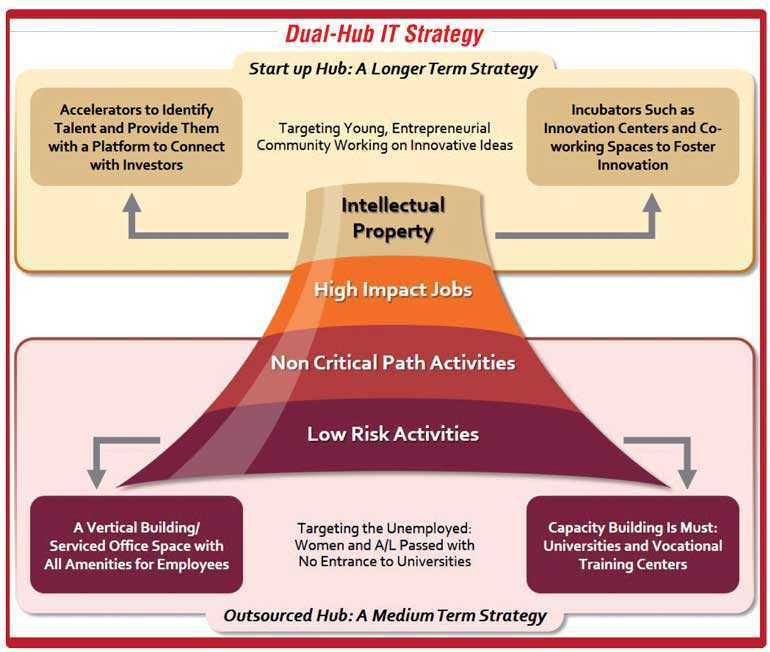 Specifically, the report called for the dual-hub strategy to be centred on the development of an Outsourced IT Hub together with the establishment of a Start-up Hub – both of which could be concurrently fostered while delivering returns along different timelines. The Outsourced Hub would involve relatively low-risk activities capable of garnering quick returns in employment, productivity, revenue and IT skilling. Initially, the report envisioned its implementation within the format of a 1,000-person managed services operation that matches local talent to outsourced demand with a gradual focus on upscaling to accommodate new market opportunities. “When considering the implementation of this hub, there are at least three potential avenues through which a Managed Services operation in Jaffna can carve a niche for itself in IT/BPO outsourcing, both globally and island-wide: Quality Assurance, Tamil Call Centres and KPO for Accounting Services,” the report added. Comparatively, Stax envisions the Jaffna Start-up Hub as providing greater long-term returns for the region and the national economy, initially focusing on the development of complex and strategic areas of expertise in specific innovations and creating a strong network of IP skills that would shift the focus from importing foreign technology to encouraging and embracing homegrown innovation. The report advocated a combination of traditional and creative startup strategies. While the traditional start-ups could focus on specialised web and app-based development and search engine optimisation, the creative start-ups could be oriented around prevailing primary industries in the north – including agriculture, farming, fisheries, tourism and health – in addition to catering to industries of necessity through products like smart street lighting, waste management, health, travel and education related apps. “The viability of this strategy is already borne out in the organic manoeuvres of prominent Sri Lankan IT start-up accelerators like Yarl IT Hub and NCIT and IT companies like WS02, Microimage and InfoMate. The current challenge, however, is that many such forward-thinking players operate in isolation or do not benefit from adequate access to resources. Through the formal inclusion of these organic activities in a dedicated strategy for Jaffna, the goal is to build momentum and focus in terms of investment and activity being channelled into this space, whether via global or local investors,” the report stated. The recommendations of the report are informed by a detailed assessment of the overall IT industry in Jaffna and the broader North – including over 100+ conversations across industry experts, national IT enablers, IT accelerators, private sector companies, local government, diaspora members, Jaffna-based employees and universities and schools. For interested investors and stakeholders, there is a clear call to action. The first order of business is to conduct an evaluation of the financial and technical feasibility of developing a Managed Services operation for the Outsourced Hub. Subsequently, there is a need to secure smart capital for this effort, which will include crafting a compelling story when pitching to relevant investors. In essence, local IT education providers need to develop industry-ready graduates. Colombo-based IT companies need to move past perceptions and seriously investigate the viability of setting up in the North. Members of the diaspora need to be engaged to create targeted flows of funding and technology transfer. Northern start-up accelerators need to cultivate the funds and partnerships necessary to foster new entrants. The Government needs to collaborate with external funding agencies, private-sector players, non-profit organisations and other investors to further develop the infrastructure and incentives for a digital hub. MDF is Australia’s flagship private sector development program. It stimulates investment, business innovation and regulatory reform to create additional jobs and increase income for poor women and men in rural and urban areas in the Indo-Pacific region.